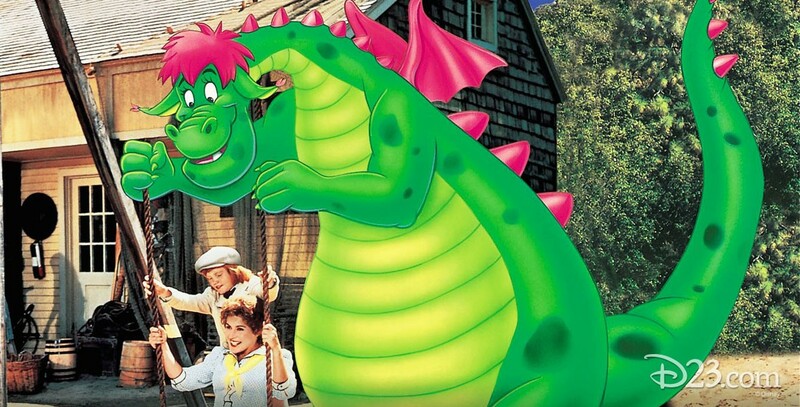 Pete’s Dragon (film) Lively musical comedy in which a magical and sometimes mischievous dragon, Elliott, inadvertantly causes chaos and confusion in Passamaquoddy, a Maine fishing village. To help a young orphan, Pete, break away from his evil foster parents, the Gogans, and find a happy home with Nora and her father Lampie in their lighthouse, Elliott must avoid the clutches of the greedy Dr. Terminus, who wants to exploit him. Premiered on November 3, 1977; general release on December 16, 1977. Directed by Don Chaffey. 135 min. Stars Helen Reddy (Nora), Mickey Rooney (Lampie), Jim Dale (Dr. Terminus), Red Buttons (Hoagy), Shelley Winters (Lena Gogan), Sean Marshall (Pete), Jane Kean (Miss Taylor), Jim Backus (Mayor), Charles Tyner (Merle), Gary Morgan (Grover), Jeff Conaway (Willie), Cal Bartlett (Paul), and featuring the voice of Charlie Callas as Elliott the dragon. This was internationally known vocalist Helen Reddy’s first starring role, and the film debut of Sean Marshall, as Pete, who went on to provide the voice for the boy in The Small One. The musical score was written by Al Kasha and Joel Hirschhorn and included “Candle on the Water,” “It’s Not Easy,” “There’s Room For Everyone,” “Brazzle Dazzle Day,” “In These Hills,” “Every Little Piece,” and “Passamaschloddy.” Animation art director Ken Anderson, animation director Don Bluth, and effects animator Dorse A. Lanpher were responsible for the ebullient animated dragon and his memorable interactions with the live actors. The story originated from writers Seton I. Miller and S. S. Field, who brought the property to Disney, where it was purchased years earlier, but it was not until 1975 that producer Jerome Courtland asked screenwriter Malcolm Marmorstein to adapt a screenplay. The Passamaquoddy town square and wharf area was constructed on the Disney Burbank Studio lot partly from the old Western set. Jack Martin Smith, the art director, face-lifted 30 existing buildings and constructed 8 more, with interiors designed on the Disney soundstages. The lighthouse for the film was built on a point above Morro Bay, California, substituting for Maine. It was equipped with a large Fresnell-type lighthouse lens, with a wickstand inside that caused a beacon of from 18 to 24 miles. In fact, it worked so well that Disney had to get special permission from the Coast Guard to operate it, since its operation would have confused passing ships. The domestic gross on the film’s initial release was $18 million, a disappointment to the Disney Studio, which had hoped for another Mary Poppins success. The movie was nominated for Best Original Song (“Candle on the Water”) and Best Original Song Score, by Al Kasha, Joel Hirschhorn, and Irwin Kostal. Because of the disappointing box office, the film was cut from its original 135 minutes to 129 minutes during its initial run. A reissue appeared in 1984 that was edited further to 106 minutes. Released on video in 1980 and 1991.